It’s amazing just how many different shovels there are out there, all of which have their own special purpose. A lot of people think that a shovel’s just a shovel, and there need be no variation. How little do they know! Not having the right shovel to do the job can be an absolute nightmare. Can you imagine trying to cut your steak with a butter knife or butter your bread with a carving knife? It just wouldn’t work. Well, it’s the same principle when you want to dig a trench or deep hole in your garden. Without the right tool to help, you will invariably struggle. And, that’s where trenching shovels come in. As the name suggests, a trenching shovel is designed for the digging and clearing out of trenches. However, it can also be used to dig deep holes near plants without disturbing them or for removing or transporting plants. These shovels come in two different designs: those that have a slim and pointed blade and those that have a tapered mouth blade that’s more narrow at the cutting edge rather than at the shoulder. Trenching shovels with the slim, pointed blades are mostly used for digging or planting in soil which is already soft. Those with a tapered mouth blade are better for penetrating more densely packed soil. You’ll notice that part of the blade on the trenching shovel is bent. This is to make it easier to get to the bottom of trenches or large holes and remove any loose debris or dirt. The head shape will differ across different models also. Some have been designed to slice through tree roots and soil like nobody’s business, whereas others are flat or more round-headed. Both the length and width of trenching shovel blades can vary considerably, so be sure to take the time to find one that’s most comfortable for you. You may also want to think about where it is you’ll be digging. If it’s somewhere that requires a little finesse and precision, a smaller blade may be more useful. The strength of the blade is also something you should take into consideration when making your purchase. Most decent trenching shovels are made out of high-quality steel as it’s known for its strength and durability. Those that have been powder coated are also beneficial as they add another layer of protection to the blade. You’ll find that the length of the shaft will vary across trenching shovels, and the length that’s best for you will largely depend on what you intend to use it for. Longer shafts are more useful when digging deep trenches, but they’re also harder to control. Shorter shafts are much easier to use, but you have to bend down lower to get to the soil. Another thing you’ll want to take note of when it comes to the shaft is the material that it’s made from. 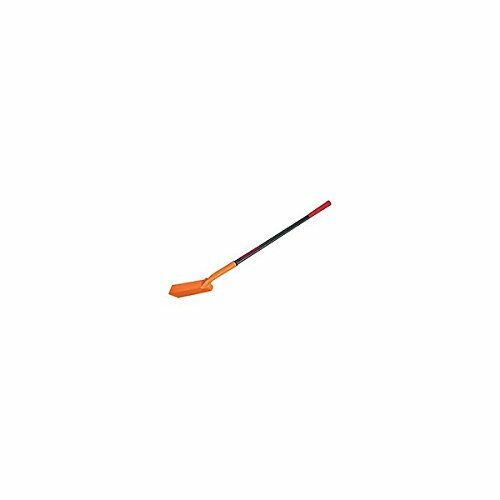 Most trenching shovels shafts are made from either wood or fiberglass. Wood is the traditional material used to build trench shovels as offers excellent durability. The problem with wood is that it’s prone to splitting or breaking due to exposure to the elements. Fiberglass shafts are often more durable than wood and require less maintenance. The problem with fiberglass is that it can be harmful to those with asthma if not coated. ​The third main part of a trenching shovel is the handle. Equally important as both the shaft and blade, the handle should be strong and easy to grip. Most trenching shovels have either a D-ring or O-ring style handle which allows for easy gripping and maneuvering. Those that have straight handles are ok too, but try and look for one that’s fitted with a rubber area to enable you to get a tighter grip. The material of the handle on trenching shovels is another thing that differs quite considerably across different models. Some are made from steel or other metals, while others are made from fiberglass or wood. All three are considered to be very good as are tough and long-lasting. If you decide to opt for a wooden handle, look for one that’s made from either ash or hickory. These are both hardwoods and are both very good at taking a lot of abuse. To ensure maximum strength, be sure to choose a model with grain that runs along the length of the handle. Trenching shovels come with three different head shapes: pointed; rounded; and square, all of which have their pros and cons. Those with pointed heads are ideal for penetrating hard soil but aren’t very good when it comes to scooping soil. Trenching shovels with rounded heads are great for scooping up loose soil and go into the ground quite easily. And lastly, those with square heads are good for scooping, but not so good for cutting into soil. This is the point where the handle and the blade meet. Look for trenching shovels that have at least one rivet that goes all the way through the shaft for maximum durability. This is the part of the blade that’s designed for you to put your foot to gain extra force for getting the shovel into tough soil. It only needs to be wide enough to fit your foot enough to apply pressure without causing any pain to your foot. The strength of both the handle and blade will depend largely upon what material they’re made from. Fiberglass, wood, and steel are all very good mediums to be used for the handle as they’re extremely durable and are likely to last a long time. The blade of the trenching shovel should also be made of something strong such as steel, ideally with an added layer of powder coating for extra protection. Most decent trenching shovel manufacturers are quite happy to provide some kind of warranty. If you can’t find one that offers a lifetime guarantee in the event that it breaks, look for one that offers at least a limited warranty. Beware of any company offering no kind of warranty. As with anything, the price of trenching shovels varies across the market, but most of this is due to the brand name and the quality of the product. If you buy right the first time, you should only ever need to purchase one trenching shovel in your whole life. So for that reason, it’s worth investing in one that’s of good quality. Made with a heavy-duty steel rounded blade and a durable fiberglass handle, this trenching shovel on offer from Seymour is a force to be reckoned with. It features a PermaGrip collar that ensures the blade will never come away from the handle and extra cushioning at the top of the handle to ensure you get a good grip. The five-inch wide head makes scooping dirt, rocks, and other materials a breeze, while the rear rolled steps help to gain ground in tough terrain. And the 48-inch handle means you won’t have to bend as much while using it. If you’re looking for a trench shovel that’s lightweight but still sturdy enough to get the job done, then be sure to check out the Ames 4-Inch Fiberglass True Temper Trench Shovel. Weighing in at just over three pounds, this tool is great for digging those narrow trenches and transporting around the garden. But don’t let the fact that it weighs so little out you off as it’s equipped with an industrial strength, pointed blade in which to cut through roots and soil with very little effort. It also features a forward turned step that allows you to put some extra effort in as needed. 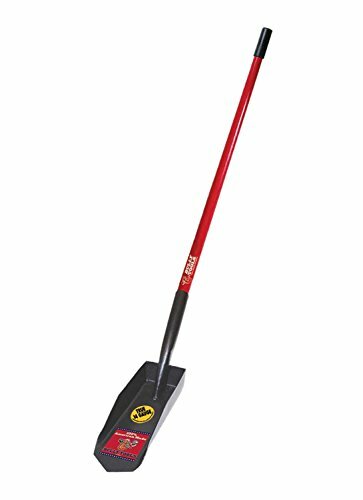 This trench shovel on offer from Corona features a super sturdy, 4-inch V-shaped blade that’s positioned at a 35-degree angle for maximum effect. Its 48-inch long shaft is made from beautiful ash wood material and is tapered to allow for better gripping and greater comfort, making it perfect for digging those deep holes and trenches. It also has a tough and sturdy body, and the 12-gauge steel blade is strong enough to penetrate most soil with a little force. The other really cool thing about this shovel is that it has one-inch deep sides that allow you to scoop up more every time. And, it even comes with a lifetime warranty. As well as being one of the most stylish models on the market, this trenching shovel on offer from Truper is also one of the highest quality around. The head is made from heavy-duty, 14-gauge steel that’s very strong and sturdy, while the 48“ handle is made from high a quality fiberglass that’s both durable yet lightweight. Rather than rivet around the collar ring to keep the handle secure, this trench shovel has a crimped steel collar which adds an extra layer of sturdiness to the design. Thanks to its pointed head, it’s great for digging in gravel or clay and is very effective in flattening the trench bottom. It’s also very effective for digging into packed or dry soil. If you’re looking for a trench shovel to use in the lightest of conditions, maybe once or twice a year, then this may be the product for you. The Bully Tools 92730 4-Inch Trench Shovel is made of 14-gauge steel, which is an indication that it will be a good quality tool, but unfortunately, that is not the case. At 47-inches the handle is a decent size and is good for extracting dirt from narrow holes, but be careful with where it’s riveted as this may not be flush. This product does, surprisingly come with a lifetime warranty, but to save yourself the time and hassle of sending it back every couple of months when it breaks, you may as well choose a model that’s not quite so poor quality to begin with. 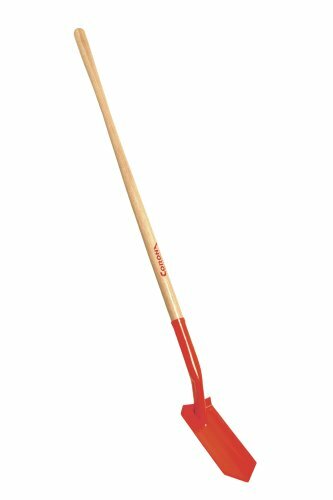 After careful analysis of each of these trenching shovels, we’ve no doubt about it that the Seymour S702 48-Inch Fiberglass Handle Trenching Shovel is the way to go. Not only is it of the highest-quality, it’s also easy to use and comfortable to hold. With a partially rounded/partially pointed blade, you get the best of both worlds. While it’s great for penetrating into really tough soil, it’s also ideal for scooping freshly dug soil. We hope you found the above article both informative and useful. You might not have to use it every day, but when it does come to using your trenching shovel, you’ll be glad you did your research and bought a decent model. Happy digging!